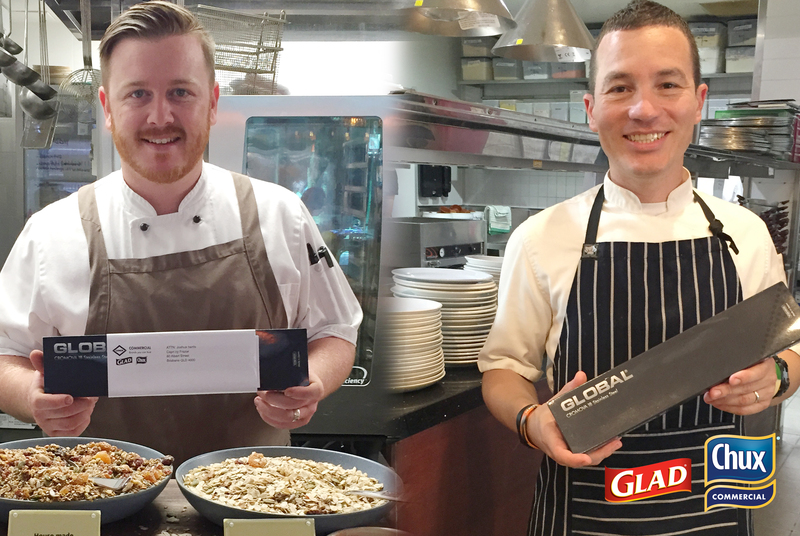 To participate in the ‘Performance Edge’ promotion and receive their free Global Cooks Knife, all foodservice professionals had to do was send in 10 barcodes from any participating CHUX and GLAD products within the Clorox Commercial range. A total of 300 Global Knives were given away to entries received between 1 October 2015 and 1 February 2016, with many entrants receiving more than one knife per establishment. Winners came from all states of Australia across a wide variety of different foodservice businesses — from bars and restaurants to sports clubs, cafes, a performing arts centre, surf clubs, RSLs, catering companies and health/aged care. “GLAD and CHUX have built up a solid reputation in the foodservice market over many years as trusted brands which stand for quality, consistency and versatile application,” says Andrew Marson, National Accounts Manager for Clorox Commercial Australia which markets the two brands. “Given our longstanding commitment to foodservice in Australia, and the strong support we receive from foodservice professionals, we wanted to publicly acknowledge and thank those professionals for their ongoing loyalty,” he added. Andrew said Clorox Commercial was very pleased at the positive response to the promotion. “It’s a great opportunity for us to reward our loyal end-users and we hope to continue this tradition into the future,” he said. Clorox Commercial products are designed with the needs of the busy professional in mind and are developed and packaged in such a way as to maximise convenience, quality, reliability, value and speed, and do the job in tough commercial environments where efficiency, cleanliness, hygiene and safety are essential to productivity and reputation. From the immediately recognisable market leaders like CHUX Superwipes and GLAD Wrap, to a wide selection of food management/storage, waste management and commercial cleaning/hygiene solutions, you’ll find all you need in the extensive Clorox Commercial range.